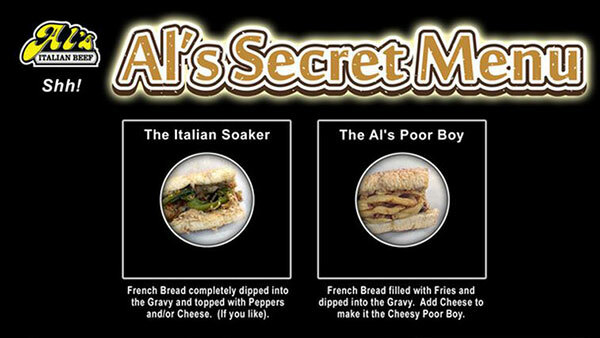 CHICAGO (WLS) -- There's one more thing you can add to your weekend to-do list: try one of the items on the newly released secret menu of Al's Italian Beef. The iconic Chicago restaurant known for its Italian beef has been compiling a list of secret menu items they've made for customers over the years. All eight items are now available at your local Al's. The Italian Soaker: French bread completely dipped into the gravy and topped with peppers and/or cheese (if you like). The Al's Poor Boy: French bread filled with fries and dipped into the gravy. Add cheese to make it the Cheesy Poor Boy. Francheezie: A cheese dog topped with a hot slice of bacon and wrapped with fries. Veggie Burger: Throw out the cow patty and add a handful of fries with any of the burger toppings. Recovering vegetarians welcome! Gypsy Fries: French fries with choice of provolone or cheese sauce, sliced Italian beef, ladles of gravy and topped off with giardiniera. BLT: Bacon, lettuce and tomato on French bread with mayo. Fire Chili: Traditional chili spiced up with hot giardiniera oil. Tamale in a Blanket: A tamale in a hot dog bun dressed like an Original Dog, wrapped with fries.